A new chapter in the Bundesliga history books was penned on Saturday afternoon as Anthony Modeste's hat-trick for Cologne means three players have now scored 20 goals or more after 25 rounds of matches for the first time ever. The Frenchman took his tally for the campaign to 22 after his treble in a 4-2 victory at home to Hertha Berlin – the same total he scored in the previous two seasons combined. The 28-year-old is now just one goal behind Borussia Dortmund's Pierre-Emerick Aubameyang in what is shaping up to be a gripping race for the Torjägerkanone – the prize awarded to the league's top scorer. 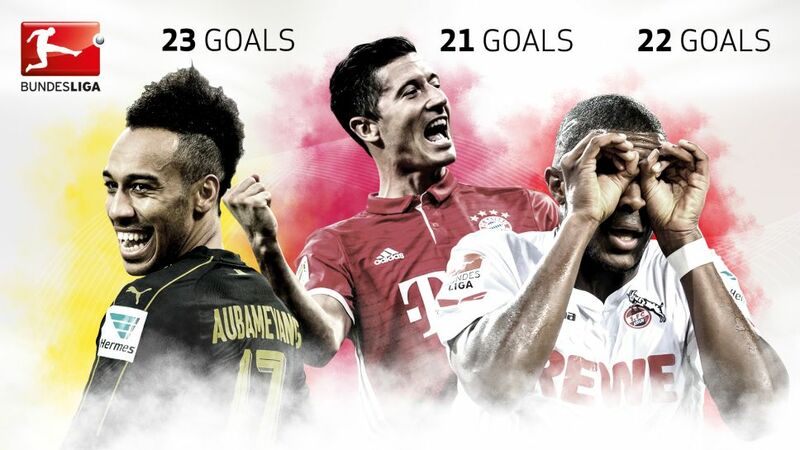 Aubameyang netted the winner for BVB in their 1-0 triumph over Ingolstadt on Friday evening, while last season's winner – Bayern Munich striker Robert Lewandowski – has 21 league goals so far, nine shy of his final haul in 2015/16. Bayern play Borussia Mönchengladbach in the weekend's final fixture on Sunday evening.